This interactive hiring guide is an absolute must, whether you're a manager, HR professional, or a small business owner. Its powerful hiring IQ test helps youdetermine what kinds of answers they should look for when asking questions in an interview-and what those answers really mean. 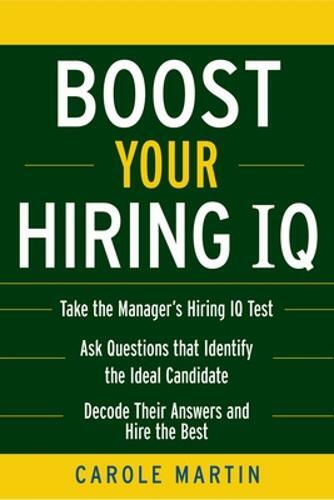 Written by renowned interviewing expert Carole Martin, Boost Your Hiring IQ is filled with practical advice on what to look for when filling a position, techniques for asking the right interview questions that really show the capabilities of a prospective employee, and questions that reveal how to hire the best person for the job.